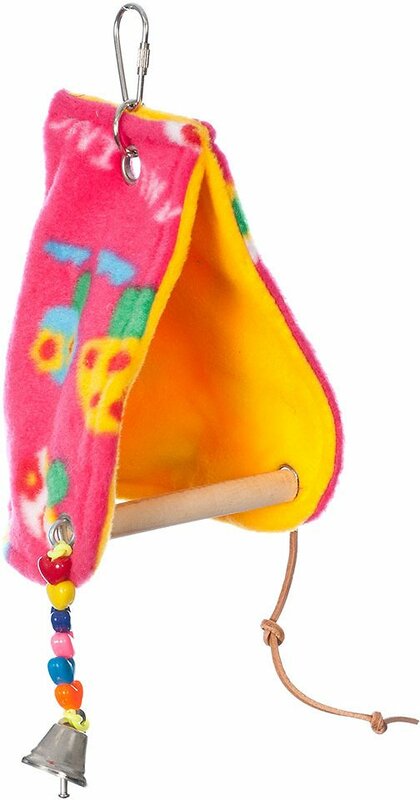 Give your pal a perch he can snuggle up in with the Super Bird Creations Peekaboo Perch Bird Tent. The soft fleece tent encourages your birdie to cuddle up at night or for naps, and provides a sense of security and comfort to help soothe stress. 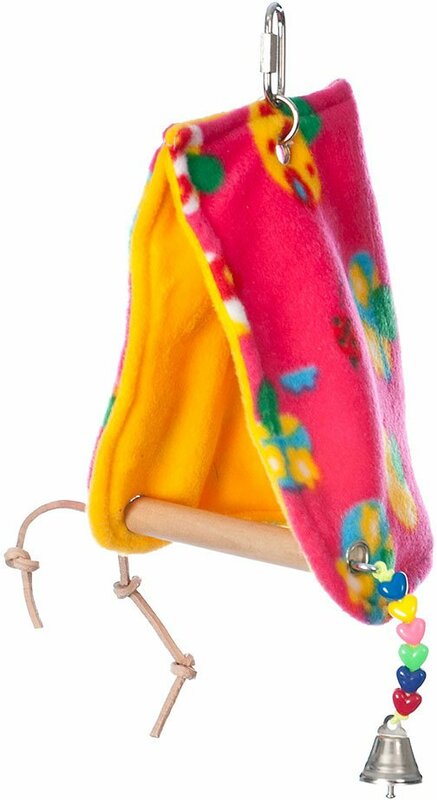 Thanks to the open bottom design, bird poop falls off easily so the tent stays clean, and it includes a built-in leather strip and beads for added play and enrichment. Plus, it’s available in different sizes to suit your feathered friend, from parrotlets to parakeets, cockatiels and lovebirds. Soft and cuddly fleece tent provides comfort and security for birds to nap, lounge and sleep in. Easy to hang from most bird cages and is made from bird-safe materials so it’s safe to use every day. Built-in toys make the perch more enticing with a leather rope, string of beads and mini-bell. Open-floor tent design keeps it clean since bird poop will easily fall off onto the cage pan. Perfect for parrotlets, parakeets, cockatiels and lovebirds and is available in different sizes to suit your pal. If you want to get your bird a snuggle tent, this is the best way to go because the perch bottom won't encourage nesting. That's a plus over other tents because laying eggs is really exhausting on a bird. This is just snug enough for a little conure or cockatiel. Green cheeks and lovebirds especially like little coves like this. Just set up the awesome Vision cage I purchased from you and hung the teepee nest inside. My lovebird is exploring now and I can't wait until he finds it! I received it really quick and it’s just as pictured but I’m afraid my finiky budgie birdie isn’t too happy with it. He won’t even go near it and fussed right after I hung it in the cage. Lol. Looks cute though. My lovebird took right to this. The only negative would be the bell & little rope like strand. The way it was shipped flattened the bell. It took the bird about 10 minutes to destroy both. It is very flimsy made - and dowel is very very loose . This thing a A LOT bigger than I assumed it was. My bird won’t use it lol!! I think she’s confused and scared of this massive beast in her cage. It’s super cute and I have no reason to not recommend it. Just make sure you check sizing before buying it. Its a cute concept but my little bird seems to still be scared of it a week after it's been in her cage.